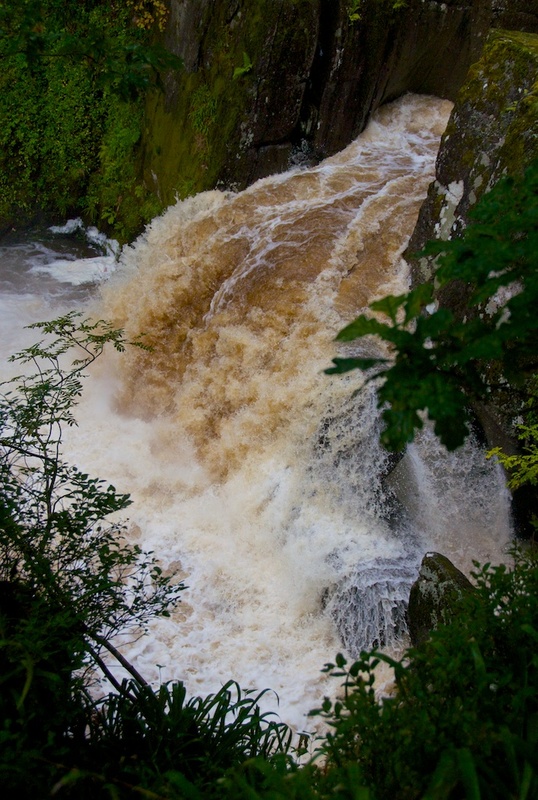 From droplets to a roaring torrent… this is the majesty of Bracklinn Falls after heavy rain, photographed on a wet day at the end of summer. Look for the brown signpost as you come into Callander from the east, and follow the road up to a car park. It’s a lovely woodland walk and there is a beautiful bridge over the falls. That looks like a good peaty whisky river! I feel like I should be shouting! Beautiful, Jo, thanks. Haha, it was pretty loud, Pat! Fantastic to hear the force of it. Difficult to convey on camera, to get the scale. Yes, it really was, Lorna – we had to be careful to stand back from the edge! This is nice, by one hand, and scary, on the other hand, because seeing such a powerful torrent reminds me of floods. Very true, Cornell, and we’ve had enough of those for a decade at least! The power of water is amazing. That is a telegraph-pole sized log down below the bridge!